Scale software is a connect with multi scale in same network, software connect with all type of company scale, just require only RS232 continue mode data. Scale software is a weighing and computing system with extensive data extraction, collection and processing functions. 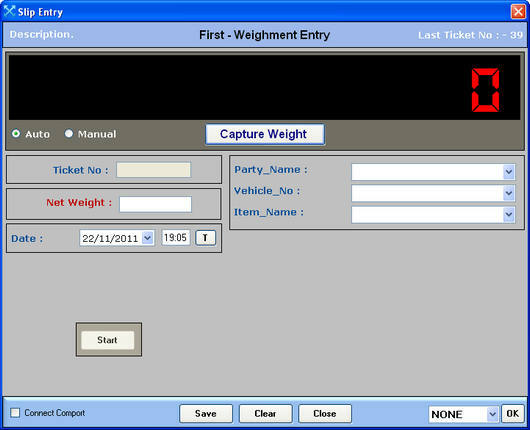 This small scale software solution is designed to help you to manage and track the critical information created at the time of weighing and label products in an easy and flexible manner. Scale software provide facility for Slip/label printing with POS, Thermal Printer can also be customized as per user requirement. Users can put their logo or use pre-printed stationery and can even design their own slip. Scale in same network, software connect with all type of company scale, just require only RS232 continue mode data. DOS Based Speedy Label printing facility. Facility to Connect/Disconnect With weighing scale. Multi User facility & he can modify Own Password Only. Manual Weigh Entry is Possible. Support to multi Database (SQL SERVER 2005 Express/ MS Access).